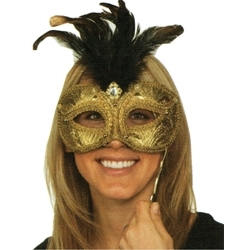 The gold Venetian mask on a stick is styled after traditional Venetian masks. Unlike most Venetian masks this one doesn't have a headband, instead it is attached to a stick for a quick reveal. This mask is perfect for royal themed masquerade parties or the ball scene from "Romeo and Juliet". The Venetian mask on a stick is colored as pictured with attached feathers. Overall length of the mask and stick is 18".